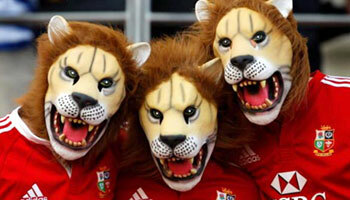 If you’re a Lions Supporter – Show us! With 3 test matches in the series (June 22nd Brisbane, June 29th Melbourne & July 6th Sydney) we’re keen to see Lion Supporters in action! In fact between now and July 6th, if you can demonstrate to us that you’re a true Lions Supporter we’ll give you a complimentary glass of beer or wine when you dine with us. How to prove your loyalty? Well you don’t have to go as far as these fellows pictured but perhaps you’re wearing your Lions scarf or jersey, a smart phone pic of your tickets. Just mention this offer, show our team your loyalty and you’re done! We know it’s hard for die hard supporters, the family wants to go out for dinner and you don’t want to miss the action. In Manly and Crows Nest we’ll subtly have the games on our large screen TVs – you won’s miss a thing while you enjoy your Snapper Pie! One complimentary beverage per person at the discretion of our duty manager, when dining for lunch or dinner at any one of the three Garfish Restaurants.